I was pretty curious about the new Samsung SmartThings V3 hub, so I ran right out and bought one to try it out just for you. Of course, you’ve heard me talk about SmartThings before in some of my other articles including this article about whether you even need a smart home hub to begin with! So is the Samsung SmartThings V3 everything it’s cracked up to be or not? What new features and benefits are there to getting a Samsung V3 Hub? Should I upgrade from my old SmartThings Hub to the new V3 from my old V2? There are a few new features within the hub itself that have changed and there are some cool new sensors that they have added on as well. The new Samsung SmartThings V3 hub is definitely a little smaller than it’s predecessor, not that it’s even that noticeable though. Version 3 doesn’t have a battery back up like the version 2 does, which was 4 double A batteries. I’ve never had to worry about the backup feature since we don’t lose power that often. So it wasn’t a big deal for my household. 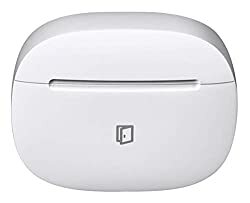 The new SmartThings V3 hub has an ethernet port but does not have to be plugged into your router like version 2 does due to its new wifi capability. 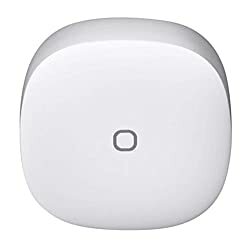 The new hub works with both Z-wave and Zigbee devices but doesn’t play nice if you want to have the previous version of the Samsung SmartThings hub connected as well. So you can only have one or the other. I have also heard that you will want to check the compatibility of whatever cameras you have hooked up to the new hub as they have removed support for a few different manufacturers for some reason. The cost factor was one of the biggest reasons that I had to run right out and buy this to test it. It’s about 30 dollars less than version 2. Talk about a bargain! You need the new SmartThings Connect App, not the SmarThings classic app in order to get this set up. However, once you add it to the connect app it will show up in the classic app. If you’d like to check out version 3 in all it’s glory, you can check out the current price over here on Amazon. SmartThings has updated all of the old sensors from the Samsung SmartThings V2 to newer models. Including the motion sensor, multipurpose sensor, a water leak sensor, smart outlet, and now they have a really cool new smart button as well. Not to worry, all of these work with version 2 hub, but all are a lot less expensive now. Making it a lot more cost effective to beef up your existing Samsung SmartThings hub. I’m a big fan of having water leak sensors. Once you have a flood in your basement (even a little one) you’ll understand the value of knowing when this is happening so you can get right on it. The nice thing about the new water leak sensors is that they have 2 sensors on top and two on the bottom, which is something that it’s predecessor lacked. There is also a new feature within the app that allows you to tell it to turn on a camera if moisture is detected, or lights or whatever you’d like. So that is a big plus. 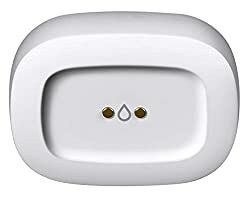 If you would like to see the current price for the water leak sensors you can check them out over here on Amazon. Some things have changed with the new Samsung SmartThings multipurpose sensors, definitely for the better. For one, the magnet is a lot stronger than version 2. It doesn’t have a mounting plate like the old version, but that is fine because it is held by this really strong 3M tape that comes with the sensor. The sensors don’t need to be as close together as the older model in order for the app to pick up on whether it is in the closed position or not. You can find these multi-purpose sensors over here on Amazon. 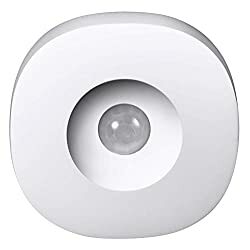 The new motion sensor has this really cool new look to it and sits on an axis point so you can move it around in all kinds of different directions. This sensor also has the 3m double sided tape that I mentioned before so it’s a lot easier to stick on the wall than the old version. The new motion sensor picks up on motion from a greater distance much better as well. If you are interested in reading more about the motion sensors, you can check them out over here on Amazon. The new button works very similar to IFTTT, you have to program the button tell it what you want it to do for one click, two clicks, or three clicks. I bought this so that I could quietly turn off things at night, as I’m always the last one to go to bed in my house. So after programming it with the SmartThings app, it worked like a charm. I just tap the button and it does what I need it to do without waking up anyone else in the house with Alexa’s loud voice. You can check out the current price for the SmartThings Button over here on Amazon. If you want to upgrade from the previous version of the Samsung SmartThings V2, it’s not that easy, I’ll warn you right now. You’ll have to manually move over all of your routines and everything into version 3. So if you are happy with your version 2, I would skip updating to from version 2 to version 3 for now. My only concern with the sensors is battery life and I think that is always my concern with battery operated Smart Home buys. 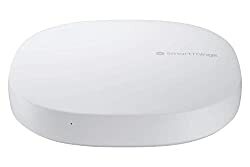 At the end of the day though, the entry price point for Samsung SmartThings has gone way down and I would say that if you are going to be implementing Samsung SmartThings smart devices for the first time then the version 3 is the way to go primarily from a price perspective. If you are interested in reading more about the best smart home devices then there is a lot more content on this site for you to read through and learn from.